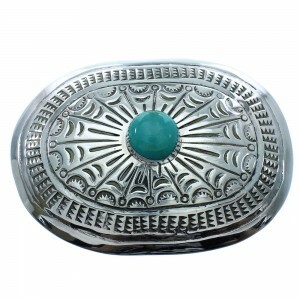 Belt buckle measures approximately 2-1/2" long, 3-3/8" at widest, and will fit a belt that is up to 1-1/2" wide. 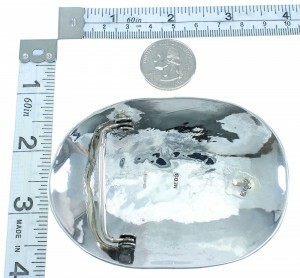 The belt buckle weighs 84 grams. An offer like this will not last long! This piece of Native American jewelry is Navajo hand crafted by artist Neds, out of genuine sterling silver and a real Turquoise stone. The stone is gently set in a hand cut bezel setting, while being accented with imprinted patterns for a magnificent finish. The belt buckle is stamped sterling and hallmarked by artist.